There are generally two reactions that I receive when someone discovers that I am a horticulturist. If that person is also into gardening and plants, they are generally excited to know that I’m as passionate as they are and this realization is followed with a bombardment of questions. “How do I get my Hydrangeas to flower? Why isn’t my grass growing under my oak tree? How do you keep the squirrels from eating tulip bulbs?” The second reaction I get is the polar opposite. This type of person is a self-proclaimed brown (or even worse…black!) thumb. And, they usually quickly change the subject from gardening to the weather- anything other than plants! You would expect that the first reaction is what I prefer to hear- but no! Anyone who appreciates plants, nature and the garden is already ‘there’. I like a challenge, so bring it on brown thumbs! I can show you that it’s not difficult and if you let me help you scratch the surface, you will find a world of green. Even at your fingertips! So a few quick pointers about Succulents: They thrive on neglect! You can go without watering these dudes for a month and they will still look up at you with love from their pots. They prefer sun, not shade, but they are forgiving and can adapt to almost any growing conditions. Let me know if you have had luck with succulents, especially if your thumb is brown! One of the...well...chicks that the hen above had! 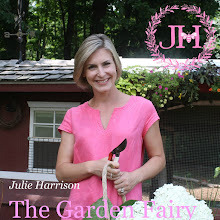 Julie - Great new blog and I love your writing style! I will definitely be one of your "followers"!